Mark Saturday the 22nd of July in your calendar as “busy”! 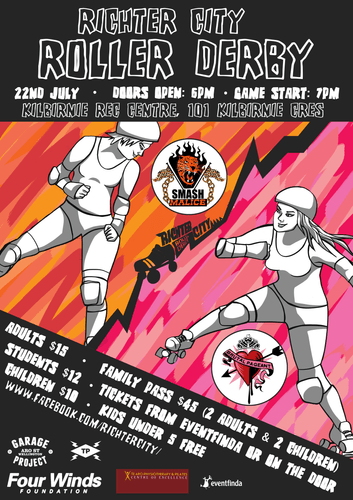 You’re not going to want to miss Richter City Roller Derby’s first Home Season game for 2017 as Brutal Pageant are going head to head against Smash Malice at the Kilbirnie Recreation Centre. Richter City turns 10 this year, and so do these two teams! Be there to celebrate the birthday of Wellington’s finest Roller Derby league and cheer on the trashy leopard-clad babes that are Smash Malice, or the down & dirty disgraced beauty queens of Brutal Pageant. Smash Malice took the crowning glory in last years home season round robin where they competed against Brutal Pageant and Comic Slams – who will take the title this year? All three home teams in the 2017 Home Season for Richter City have skaters from the All Stars and Convicts squads, along with some fresh new faces with a whole bunch of talent. Get your signs ready and your team colours on! Any Wellington-based Roller Derby fan will tell you home season is not to be missed. Get your tickets from www.eventfinda.co.nz or on the door. Tickets are $15 for adults, $12 for students, $10 for kids (and under 5s are free). Doors open at 6pm, game starts at 7pm. To keep you refreshed, happy, thirst-quenched and full, the Garage Project Bar, Antojitos Taco Truck and a range of other goodies will be making an appearance. Richter City would like to say a huge thank you to our wonderful sponsor's Garage Project, Thunderpants and Te Aro Physiotherapy & Pilates.